Today we are going to review a sauvignon blanc wine – that crisp, dry and aromatic wine, that is famous all over the world. The origin of sauvignon blanc is France, yet, it become famous on the international scene in the 1980’s with an extravagantly forceful, fruity style from New Zealand. Nowadays, fine sauvignon blanc wines can be found in California, South Africa, Australia and also around us in Romania and Moldova. 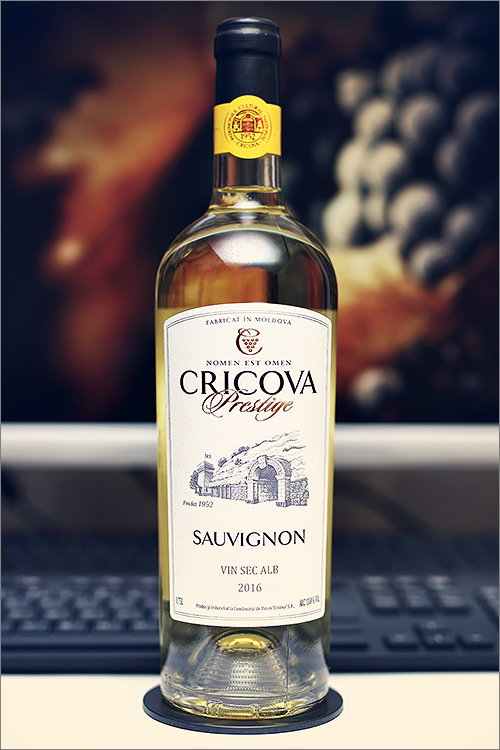 The wine we’ve selected for the review tonight is one of these – Prestige Sauvignon 2016 from Cricova. Without further ado, let’s move on to the tasting! Straw green color with pale white shades towards the rim of the glass. The nose is strong, filled mostly with sweet fruit and herbal flavours: straw grass, hay, fresh cut grass, pomelo, kiwi, camomile, green apricot, green apple, daisy flower, dried linden flower, gooseberry, pear leaf, wild pear, green melon and some nuanced hints of arugula. The wine is medium-dry, with moderate alcohol level, high acidity and ripe tannin. It feels zesty, herbaceous and refreshing, with a nuanced bitter-crisp accent. This is a smooth, lean, round and supple wine, with a fair overall balance, as it tastes crisp, very aromatic and mineral – it makes the impression of a very harmonious wine. It has a medium finish and a balanced, quite smooth and velvety aftertaste. This is definitely a great Wine of Moldova and the overall rating says the same, with 90.1 points scored it is right there, among the best wines we’ve tasted so far. Please click on the chart icon on the left in order to get to the wine rating page, where you can find all the wines we’ve tasted to date. Conclusion: this is a fine sauvignon blanc wine in its prime form. You can age it for another 3-6 months, but we strongly recommend to drink it now, as long it’s still young and beautiful. This is exactly that kind of wine, one finds relatively easy to improve by food pairing. Try it alongside some herbal rice salad with peanuts and lime or an arugula salad with walnuts, blue cheese and cranberries. And remember: it is always better to drink a wine a year too soon than a day too late. Enjoy!